Can you confirm these amateur observations of Trogonophis wiegmanni? elegans: Morocco; Type locality: ‘‘Alger et a` Tanger’’; restricted to Tangier (Gans and Pasteur, 1962: 10). Type locality: Unknown; restricted to ‘‘Algérie’’ (Pasteur and Bons, 1960: 79). Types Syntypes: lost, originally ‘‘Zool. Inst. Giessen’’ (Kaup, 1831); destroyed (W.J. Schmidt, cited in GANS 2005). Comment Synonymy: after Gans 2005: 43. 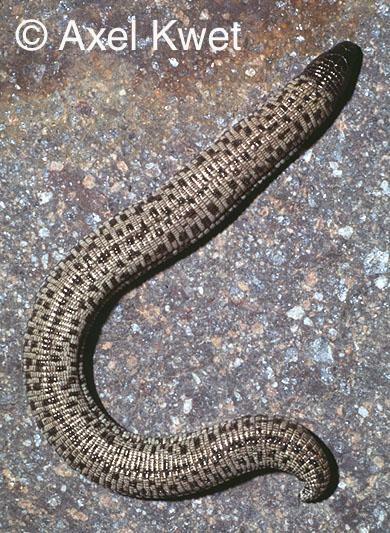 Type Species: Trogonophis wiegmanni is the type species of the genus Trogonophis. Diversity: Salvi et al. 2017 found 3 cryptic species within T. wiegmanni, although they did not describe them as new (yet). Note that the family Trogonophidae is sometimes spelled as “Trogonophiidae”. We follow Gans 2005 by spelling it Trogonophidae although in previous versions of this database it was spelled Trogonophiidae. Gervais, PAUL 1835. Les principaux résultats de l'étude . . . de reptiles envoyés de Barbarie. Bull. Soc. Sci. Nat. France (dernier trimestre), Séance de 23 Dec. 1835, Vol. 1: 112-114.